The 17-year-old beat Rosie Youngman (Northampton) in the final after knocking out former champion Karen Lobb and Charlotte Taylor (both Northants County) in the quarter-finals and semi-finals respectively. Youngman was looking to make it a hat-trick of wins against home club members after victories in the previous two rounds against Carol Gibbs and Mary MacLaren, who won the 36-hole strokeplay qualifying competition. Although last year’s champion Claire Lindsay (Northampton), who beat Darnell in the final 12 months ago, missed out in qualifying, she did have the consolation of lifting the Ladies Swannell Salver with victory over club-mate Lorraine Gilder. NORTHANTS men came up agonisingly short in their first and second-team opening fixtures in the 2018 Anglian League as they lost both matches 6½-5½ to Leicestershire & Rutland. Competing at Wellingborough GC, the county first team never recovered from a poor morning session as they picked up just a half point and lost the other three foursomes ties. The players responded positively to a half-time pep talk as they won the opening four singles games, including an excellent 6&4 victory for Callum Farr. But defeats in games five, six and seven against a team that has won the league twice in the previous four years meant a 2&1 win for home club member Jamie Milligan in the closing game didn’t affect the final result. The second team went down by the same score to the reigning champions at Cosby. Northampton’s pursuit of a first Handicap League crown got off to the ideal start as they secured a 14-8 win at Northants County. and Mark Shelswell (four holes), Gary Slinn and Robert Smith (four holes) and Craig James and Simon Hunt (six holes). 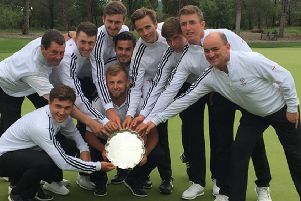 Reigning champions Collingtree Park produced a clinical performance at home to Cherwell Edge as they secured a 7-0 whitewash. Although there was little to choose between the two teams in all six ties, Collingtree triumphed thanks to Philip Read and Trevor Twelfree (one hole), Anthony Brown and Andrew Dennis (two holes), Roo Smith and Iain Tait (three holes) and Stephen Low and Peter Owen (one hole). Brampton Heath put down an early marker in their section as they recorded an 8-5 success at Daventry. Lee Bellham and Nigel Packer (five holes) kept the visitors in the contest early on, before Michael Burrows and Gary McAllister (one hole) and Steve Nixon and Ian Haynes (two holes) sealed a narrow victory with two late wins. Four pairs games were halved in Kingsthorpe’s remarkable home clash with Hellidon Lakes as the hosts triumphed 6-3 thanks to a convincing win in one of the middle ties. NORTHANTS pro Ryan Evans recorded his best finish on the European Tour for almost two years as he grabbed a share of 11th prize in the Rocco Forte Sicilian Open in Italy. Evans, whose best result on the European Tour was third in the 2016 Czech Masters, gave himself a chance of a first victory at this level when he carded a blemish-free six-under-par 65 to lead after the opening round. Although the 31-year-old stayed in contention with a 69 on day two, scores of 71 and 70 over the weekend meant he finished out of the reckoning. Northampton moved level on points with Wellingborough at the top following a 6-1 home win against Kettering. Although the visitors took the opening tie on the 18th hole, Northampton remained in control, thanks to wins from Geraldine Morris, Sue Avison, Annie Goodchild, Helen Brownless, Susan Kreft and Divya Wilson. Oundle came close to backing up their away success against Rushden last month with another away win as they were narrowly beaten 4-3 by Cold Ashby. Peterborough Milton started their campaign with a positive home result as they defeated Delapre 5-2. Daventry collected their first victory of the season at the third time of asking as they held their nerve to beat Northants County 5-2 at home. With more than half of the games going the distance, the Daventry trio of Jacquie Bailey, Valerie Denny and Lynda Partis all secured vital points on the 18th hole. 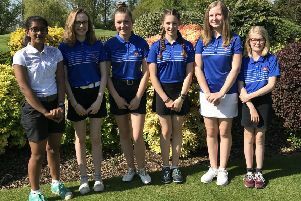 Peterborough Milton recorded their second narrow victory in two outings as they beat defending champions Overstone Park 2-1 at Northampton GC. Karen Trevor won the 18th hole to take the opening tie for Milton and although Chris Gore replied with a 2&1 success, Peterborough secured the points thanks to Carol Dunn (2&1). Overstone have now lost both their matches this year.